Children in LAUSD schools: Two daughters, Lorna and Simone, graduated from LAUSD schools. They attended Multnomah Street Elementary. Lorna went to Peary Middle School and graduated from Bravo High School. Simone graduated from Los Angeles Center for Enriched Studies. 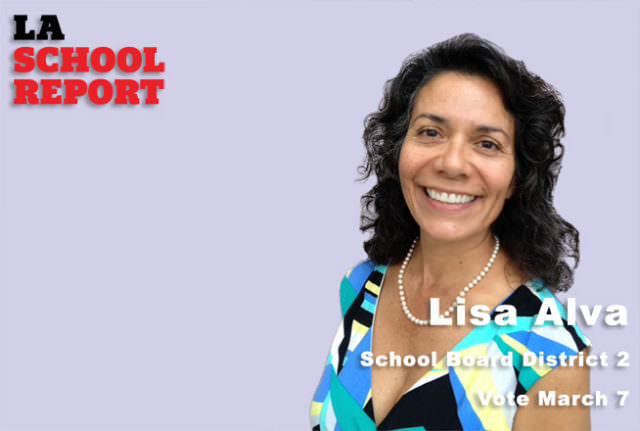 Throughout her 18 years as a public school teacher in LA Unified, Lisa Alva has sought leadership roles where she could bring a teacher’s voice to decision-making processes. That mindset has now brought her to run for one of the most powerful positions in education in Los Angeles — a seat on the school board dais. “I want to bring a teacher voice to the Board of Education. I want to represent the classroom truly and completely,” she said. Alva, 55, has mounted a grassroots campaign to represent District 2 which covers the area around Downtown Los Angeles, East Los Angeles and Boyle Heights. She is running against incumbent board member Mónica García, who seeks her fourth and final term, and Carl J. Petersen, a businessman and parent advocate. Alva said she began thinking about running for school board eight years ago when she was teaching at Roosevelt Senior High School. She said new testing and curriculum materials were being forced onto teachers without teacher buy-in. She thought the district was wasting resources on the materials. “I started to question the decisions and then I wanted to be part of making the decisions,” she said. Alva had roles at Roosevelt High as the school’s Western Association of Schools and Colleges (WASC) accreditation coordinator and as a member of the School Site Council. In 2008, the nonprofit Partnership for Los Angeles Schools spearheaded by former LA Mayor Antonio Villaraigosa began its management of Roosevelt High School. Alva joined the Partnership’s board of directors. She served on the teacher advisory board of Educators 4 Excellence to bring a teacher’s voice to policy decisions. Alva ultimately resigned from both boards due to the iPad scandal. “I was just bewildered at the difference in our ultimate goals,” she said of the organizations that were strategizing to support former LA Unified Superintendent John Deasy. She said she admired Deasy for his goals. “I didn’t see a match between what was good for the classroom and what he was trying to do,” she said. She also criticized García for not being there for teachers during the restructuring at Roosevelt. “Unfortunately our board member does not listen to that teacher voice,” Alva said of García. Teaching was not Alva’s first choice as a profession. After graduating from college she lived in Oregon and Seattle with her husband for eight years where she owned a catering business and a recreational vehicle park. Her marriage dissolved and she moved back home. She chose the teaching profession because of its stability. “It took a couple of years but I did fall in love with it and I’m very much enjoying my classroom this year,” she said. Alva lives in El Sereno in her childhood home and is proud of her family’s ties to the community. She said her mother worked for 30 years at the elementary school she and her sisters attended, Multnomah Street Elementary. Her parents met at Lincoln High School. Her immediate family members are or have been union members. Alva has served as chairwoman of United Teachers Los Angeles’ Professional Rights and Responsibilities Committee. She was also part of a NewTLA, a grassroots effort to encourage younger members to participate in the union. Alva also completed a fellowship with the National Education Association. UTLA has not endorsed in the District 2 race. It has endorsed and given financial support to school board President Steve Zimmer in District 4 and Imelda Padilla in District 6. Alva said she sat down with UTLA representatives a couple summers ago and was told she probably wouldn’t get an endorsement. She said she appreciates that the union is supporting Padilla. To get her message out, Alva said she has some professional help but has mostly relied on a team of teachers. Some of the endorsements she has received have helped with some expenses. “It’s so so so important to protect the people that depend on public education and to protect public education in Los Angeles,” she said. Alva said she first got involved in the decision-making process at the first school she taught at, Peary Middle School in Gardena. She became the school’s testing coordinator. She said she learned the benefits of small learning communities by working with the principal of Robert F. Kennedy Community Schools, a campus of six pilot schools. Pilot schools share some of the same autonomies given to public charter schools, such as flexibility in scheduling. Teachers enter into a contract with a principal. Pilot school teachers are almost always unionized. “I wanted to see how much of a difference it makes when a principal is able to organize everything from day one,” she said. Alva volunteered as the principal’s assistant at UCLA Community School, which is part of the RFK pilot schools, and Miguel Contreras Learning Center downtown. “I learned that pilot school teachers are seriously invested in their kids and their communities and are very invested in making a school a success and will do whatever it takes,” she said. One of her first priorities, if elected, would be to create financial stability for classroom instruction. She said teachers shouldn’t have to pay for their own supplies. She said she would advocate reforms to Proposition 13. She said corporations should pay their fair share. But there would need to be a balance of sales and property tax increases, so as to not burden the tax base. She admitted she doesn’t have a specific answer to solving the district’s budget crisis. Running for school board has been a “huge learning curve.” She said she has been trying to catch up on school board issues. She teaches English to 180 students at Bravo Medical Magnet High School. Another priority would be school safety. Alva pointed to the board’s decision to ban suspensions for willful defiance before fully training teachers in restorative justice practices. She said restorative justice is an effective process, but she said teachers need an alternative way to discipline disruptive students until training is completed. “Teachers, staff and students have a very difficult time when there is no expertise and no training,” she said. When it comes to charter schools, which are public schools and nearly all run by nonprofits in Los Angeles, Alva initially called for a moratorium. But she clarified in a subsequent interview that she doesn’t think that would be legal. “Let’s make sure that they’re doing right by kids, let’s help them. It doesn’t make sense to try to do something that’s not legal,” she said. She said she appreciates that charter schools are being held accountable. In October, the LA Unified School Board voted to deny charter revisions to three Magnolia Public Schools and two Celerity schools. The Magnolia schools successfully appealed the denial to the Los Angeles County Office of Education. Alva described the recent federal government raid on Celerity school campuses as “pointing out some of the more obvious problems” in charter school management. She said she wants to learn why parents are choosing charter schools over traditional district schools. Alva criticized her opponent, García, for getting up from her chair on the dais when Alva was addressing the board during a public meeting. “We need to have a responsive board member who is actually going to listen with compassion to every single constituent, and I want to be that person,” she said. Alva described her leadership style as collaborative, something that she learned as a classroom teacher. “I’m willing to put my personality aside,” she said.